Removes dirt, oil and grime quickly. Cleans in minutes. 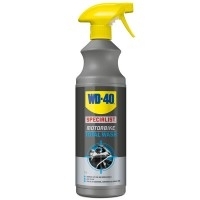 For use on bodywork, components & carbon fibre. This product is an all-purpose cleaner designed to quickly cut through traffic film and road grime. This formula leaves a great finish and is sage to use on paintwork, plastic, rubber, aluminium, chrome, carbon fibre and disc pads – basically all over the bike!